It's a staple in the LA show circuit and easily one of the most prestigious. Unique L.A. curates made-in-the-USA designers and makers that are often "what's happening now." Member Angela Price of Eden Condensed just completed her sixth Unique at this past holiday show (the biggest show for Unique!). Check out what she had to say about her experience. Member Angela of Eden Condensed at her booth at Unique LA's holiday show. Q: Tell us about your shop. 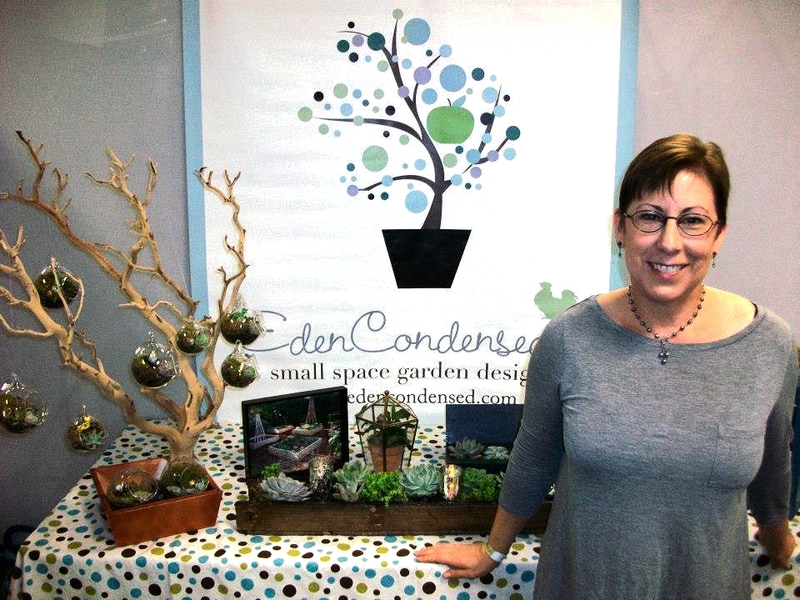 I am a garden designer, and I founded Eden Condensed in April of 2011. I specialize in small spaces like raised bed organic vegetable gardens, and gardens for patios, balconies, and small yards. I also create a line of hand blown glass miniature terrariums and vintage container gardens. I have always been a gardener and miniatures are a passion of mine, so the terrariums are a perfect combination of the two. I work with a US based glass blower, who makes the tiny (2”-5”) glass globes for me, and then I create tiny worlds inside them with miniature live succulents, figures and other accessories. Q: Why did you decide to show at UNIQUE LA? A: The 2013 Holiday Show was my sixth UNIQUE LA show, and I always do great business there. The UNIQUE staff is extremely well organized, and the other vendors are always so helpful. Plus they do a lot of marketing – both grass roots and formal, which draws a ton of customers. Q: What's the application and jurying process like? What requirements do you have to meet? Applications are made available on the ULA site usually about 2-3 months in advance of the show. What sets this show apart from the others is that your products must be made in America. Probably 80% of the vendors are local to Southern California. This is a very competitive show. They usually get a lot more applications than there are available spaces. It’s my impression that the ULA staff looks for what is on trend, artistic, urban, unique, and of excellent quality. Having great photos on your website or online store is very helpful as is a willingness to be part of the ULA community. You can apply for either a booth space or a table space. Q: What was the atmosphere like? Who was there? What could you do? A: The Holiday Show is in the Penthouse of the California Market Center in downtown LA. Booths are 10’x10’ and include translucent walls. Vendors go all out in decorating their booths to look like small shops, which makes this show such a fun place for shoppers. Even those with table spaces use every bit of space to showcase their products creatively. The atmosphere is crazy, busy, and fun. Something like 23,000 customers came through the show. There’s an admission fee to get in, so people are serious about shopping. Also, there are free drinks, a yummy café, the Oh!Snap! Photo booth, and crafts throughout the day. Q: What kind of vendor would do well here or not do well here? A: As I mentioned before, this is a competitive show. The biggest category is jewelry/accessories, so there are a lot of jewelry designers who apply. Vendors need to understand what makes them special. There are a couple other vendors who also do terrariums / succulents, but we all have very different styles. I also think that vendors who are passionate about their products and enjoy talking to customers are more successful. If you like to sit behind a table with your head down playing with your phone all day, you’re not going to have a good show. Q: What should people considering the UNIQUE LA show know about it? A: This is a 2-day show that runs 11am-6pm each day, so it can be strenuous. Have a plan to eat and go to the bathroom, so you don’t leave your booth unoccupied. Have a way to accept credit cards (I use Square). Also, make sure you are well organized in your load in/load out. At the California Market Center, you park in an underground parking structure, and then take two different sets of elevators to the Penthouse. There is a loading dock, but the fewer trips you can make, the better.